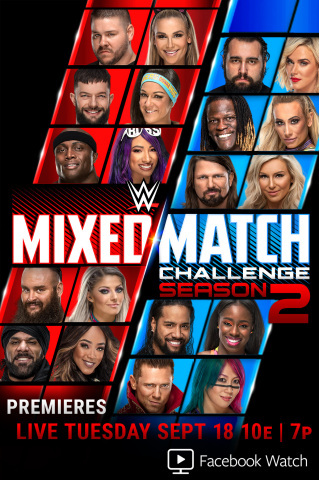 STAMFORD, Conn.-- Facebook and WWE (NYSE: WWE) today announced that the in-ring series, Mixed Match Challenge™, will return for season 2, streaming live exclusively on Facebook Watch on Tuesday nights beginning September 18 at 10 p.m. ET. The series will be available in the U.S. and, for the first time, now stream live on Facebook Watch in Australia, Brazil, France, Germany, Indonesia, Mexico, Philippines, Spain, Thailand and Vietnam. Fans can follow the Mixed Match Challenge Facebook Page to add episodes to their personal Watchlists. Mixed Match Challenge season 1 generated more than 35 million views in the U.S. alone, and resulted in WWE Superstars The Miz and Asuka winning $100,000 for their team’s charity, Rescue Dogs Rock. WWE is a powerhouse on social media with nearly 1 billion followers globally. WWE has nearly 500 million likes across all Facebook Pages and WWE’s main Facebook Page has more than 39 million likes. WWE Superstar John Cena® is the #1 most-followed active U.S. athlete on Facebook with more than 44 million likes. WWE, a publicly traded company (NYSE: WWE), is an integrated media organization and recognized leader in global entertainment. The company consists of a portfolio of businesses that create and deliver original content 52 weeks a year to a global audience. WWE is committed to family friendly entertainment on its television programming, pay-per-view, digital media and publishing platforms. WWE programming reaches more than 800 million homes worldwide in 24 languages. WWE Network, the first-ever 24/7 over-the-top premium network that includes all live pay-per-views, scheduled programming and a massive video-on-demand library, is currently available in more than 180 countries. The company is headquartered in Stamford, Conn., with offices in New York, Los Angeles, London, Mexico City, Mumbai, Shanghai, Singapore, Dubai, Munich and Tokyo.